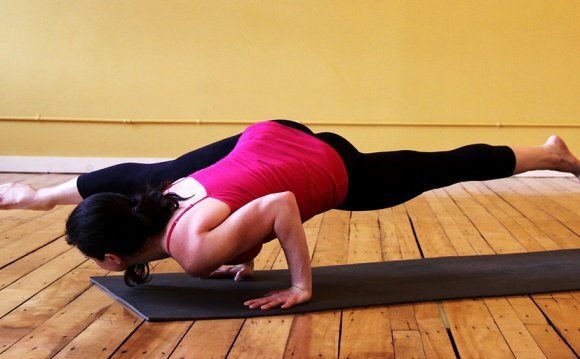 Looking for serious arm balance inspiration? Look no further than Dylan Werner of Equinox, who performs a sequence of stunning arm balance poses — and breathtaking transitions — in this “Desert Yogi” video shot in White Sands, New Mexico. Werner, who teaches all over the world, admits that the poses he does in the video, including One-Arm Peacock, Handstand Scorpion lowering to Forearm Scorpion, and Handstand Lotus, are not exactly accessible to beginner (or even most intermediate) yogis. But if you’d like to get there someday, here are his 5 tips for building an arm balance practice. If you don’t have flexibility in your wrist, then the muscle tension in your forearm will actually pull you out of a Handstand or arm balance or not allow you to get your weight forward enough to find the balance, Werner says. “The wrists are not designed to support your weight in a handstand or arm balance, but if you put in the work, they will be strong and flexible, ” he explains. Werner warms up his wrists before any class or practice for about five minutes—until they are slightly sore. Make sure you stretch the front and back of the wrist as well as work the range of motion by circling the wrist. Start on your hands and knees, keep your arms straight, lean forward and back till you feel a stretch, then make circles. Do this on the front and back of the hands. Turn the hands inward and outward. When doing arm balances, instead of putting your weight in the heel of your hand, put it at the metacarpophalangeal (MCP) joint at the base of the fingers and the top of your palm (i.e., the knuckle between your hand and your fingers), Werner advises. “When your weight is in the palm of your hands, there is nothing to stop you from falling backward. By moving the balance point forward, you have more control in your Handstand, ” he says. “We need to utilize the shoulder blades to support the arms, especially when they are straight in a Handstand or straight-arm arm balance, ” Werner says. You can build straight-arm scapular strength by holding an engaged Plank instead of sinking down into the shoulder blades. “Think Cat Pose in Plank position, ” he explains.